Friedrich Petzel Gallery is pleased to present "Projection" an exhibition by Andrea Fraser. Andrea Fraser's installation consists of two video projections at opposite ends of a long, narrow, darkened room. 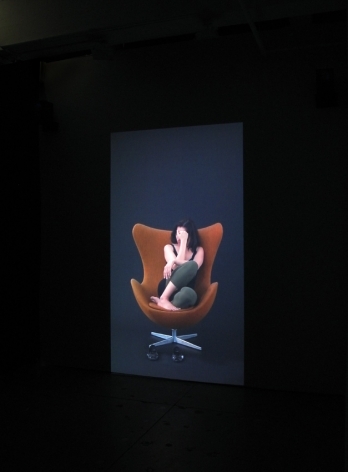 Both projections feature the same performer in the same clothing sitting in the same chair in a seamless black space. The images alternate through 12 short monologues, with the image on one wall fading to black as the next scene begins on the opposite wall, and then fading up again as that monologue comes to a close. In each image, the performer addresses the camera directly, creating the effect of addressing both the image on the opposite wall and the viewer in the middle of the room. The program of scenes loops seamlessly, with no definite beginning or end. Projection is based on video recordings of intensive psychoanalytic consultations in which Fraser participated as a patient. Fraser transcribed these video recordings, separated the two sides of the dialog and edited the transcripts down into two individual scripts, each composed of six short monologs in the form of one-sided dialogs. This process also involved adapting the dialog to the gallery space by substituting the present for the past tense and second for third person pronouns, as well as replacing specific nouns and proper names with shifting indexical and demonstrative terms. Fraser then performed these scripts for video, addressing the camera directly. These recordings are projected life-size in an alternating sequence on opposite sides of the gallery, placing the viewer in the position of the addressee and object—or, perhaps, the screen—of each projection. Through this experience, Fraser aims to make explicit some of the latent psychological projections that inevitably structure the relations between artists and art works and their viewers. Since the mid-1980s, Fraser has investigated many aspects of the field of art, often focusing on social, institutional and economic structures and relationships. With Projection, she turns her attention to the psychological structures that may underlie or operate alongside these relationships. Projection may be Fraser's most direct attempt to date at applying, in her work, the psychoanalytic framework that was fundamental to the early development of her approach to site-specificity, performance, and institutional critique. At the same time, Projection is an interrogation of aspects of these practices from a psychoanalytic perspective. It attempts to activate, in the gallery space, the psychoanalytic principle of transference interpretation in the "here and now" of a specific situation and relationship. The paradox of this psychoanalytic "site-specificity," however, is that what takes place in the "here and now" it posits are relationships displaced from other sites and scenes. Their enactment is always also a re-enactment, a staging, a kind of performance. Winter 2005) and "Psychoanalysis or Socioanalysis?" (Texte zur Kunst, December 2007). Thanks to: Rhea Anastas, Chris Bassett, Tom Brod, Morya Davey, Jesse Green, Lawrence Jacobson, Julie=2 0Orser, Rebecca Quaytman, Alex Segade, Andy Stewart, Dr. X. This is Andrea Fraser's third solo exhibition at Friedrich Petzel Gallery. Fraser exhibits in both the United States and internationally. Her work is in public collections worldwide, including the Centre Georges Pompidou, Paris; Museum of Modern Art, New York; National Gallery, Berlin; and Tate Modern, London. In 2005, the MIT Press published Museum Highlights: The Writings of Andrea Fraser. Andrea Fraser lives and works in Los Angeles. Friedrich Petzel Gallery is located at 537 West 22nd Street, New York, New York 10011. For further information, please contact the gallery at info@petzel.com, or call (212) 680-9467.